How are individual investors doing? Active management that chases short term results, often jumping on the bandwagon when it's too late. 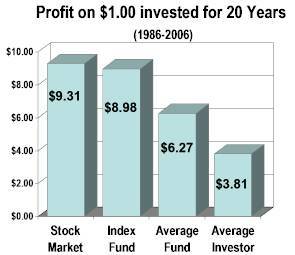 The chart shows how the average Stock Market Index Fund closely matched the Stock Market average return over 20 years, while the Average Fund (including actively managed funds) lost 1/3 of its return to fees and owning the wrong investments. The average, using timing and chasing "what's hot" lost 60% of the returns available to them in the market average. "No, most fund investors have not been given a fair shake."